In the Salon of 1835, a huge painting caused a sensation. Based on recent history, the dramatic scene was particularly emotional for the viewing public. 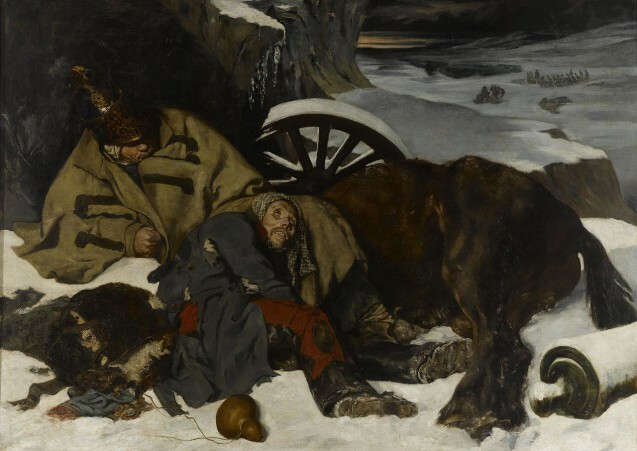 In the twilight, two dying soldiers and a dead horse lying in the snow symbolise the horror of the retreat from Russia. Around them are scattered the last remnants of the Grande Armée: a cannon, a wheel, some tattered packaging… Gros’s pupil, Boissard de Boisdenier, was the author of this heart-rending painting. A poet and a musician, Boissard the painter is known only through this remarkable picture, although he also achieved a certain notoriety from his connection with the Club des Haschichins, a literary group which met in the Hôtel Pimodan on the Ile Saint-Louis in Paris and which counted amongst it members such bright lights as Nerval, Baudelaire and Théophile Gautier. Just like other painters of the Romantic movement, Boissard took his inspiration from the ‘légende noir’ or critical view of the Napoleonic epic. It is true that Boissard can be seen to be descended directly from his teacher, Gros (who had become the gardian of Neoclassicism after the exile of David) – the snowy foreground is clearly indebted to Gros’s The Battle of Eylau. But the pupil outdid master. For at the Salon of 1835, for which Gros exhibited a work on a mythological subject, Gros’s painting was generally disliked whilst that of Boissard was feted. Boissard was also influenced by Géricault, as can be seen in the emaciated head of the soldier, itself very similar to Géricault’s rendering of some men being punished; the dead horse is likewise very close in style to one of Géricault’s lithographs. As for its subject matter, the painting uses a part to represent the tragedy of the whole. The following year at the Salon of 1836, Charlet was to opt for a diametrically opposite approach. His Episode from the Retreat from Russia is a scene of mass movement, a veritable human sea rushing towards its doom. Here the Grande Armée is reduced to an isolated group: a Dragoon of the Imperial Guard, a Hussard, a horse. Huddled together in a clearly vain attempt to keep warm, these soldiers are very picture of disaster. To use Victor Hugo’s image from L’Expiation, the snow has become an immense shroud for an immense corpse.